Before continuing on with the outdoor adventures, cruising and resto food tasting, a word from our sponsor. Well, not really. No, that’s not me with a fencing sport mask. 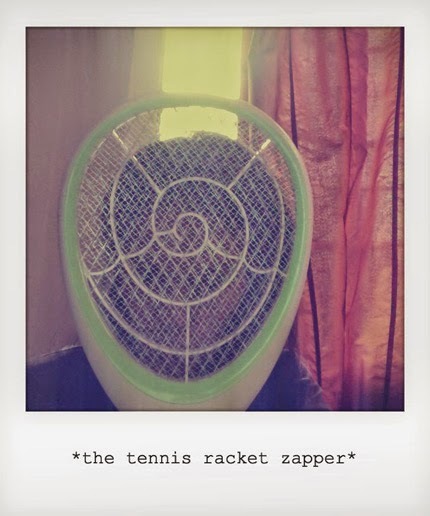 It’s an insect zapper shaped like a tennis racket and it’s a very handy deadly weapon against island nemeses such as the mosquito, fly, fruit flies, bugs attracted to light and even yourself if you like to get an electric sort of high. The racket makes a stunning sound when the target finally gets electrocuted, burns and dies. I understand it sounds vengeful but if you live here in the Philippines, you will appreciate the death of these vectors and knowing you had a hand in their demise, albeit only one bug at a time. The item can be purchased in department and general merchandise stores such as Gaisano, Save more, Robinson's Place at the home section items and the hubs got ours at "578" Store for a nominal amount.